my fiance and i have a similar system where we thrown both of our checks into one pot, then get an equal personal allowance to spend as we wish. so far, so good! i also think it's important to look at the money you bring in separately as "ours" instead of yours and mine. it reinforces the mentality that we're a team now and we're focused on common goals. all of our spending is in the open, we talk about how the joint money will be spent every month, and we're attacking our financial obstacles together. i'm sure this approach wouldn't work for everyone, but for us, anything else would just feel like we're roommates paying our share of the bills. If I may be so bold, it really is imperative that you also have an emergency savings fund. Six months income at least is what is suggested. That way, if something happens, like an illness, an injury, a lay off, etc., your bills are still covered and you don't have to totally freak out over where the money is going to come from. My fiance and I are figuring this financial stuff out, too. Since right now everything we own is separate and we pay for it all separately and we have separate businesses, I think right after we marry we will just open a joint investment and savings account of some kind. But that plan will have to be totally reworked when kids come along, due to the lifestyle we wish to lead - my work load will have to be cut way back. Caroline, of course you can be "bold"! Please, I absolutely appreciate others' perspectives. Matt and I are hardly saving enough as it is in each of our four categories (home improvement, cars, retirement, and vacation), so I don't think we could add an emergency fund at this point. However, I figure if we do have an emergency, we'll just have to pull from each of those four accounts as necessary. It's definitely not ideal. money has not been much of a problem for us in that we share it easily. i am still in school, he is not, there are ebbs and flows with who brings in more or less, but we have a similar system in that we pool then get equal allowances. though we are different in the we are not savers. either one of us. and as you pointed out, because our monthly shared spending money is not separated out, it is really easy to go over. thanks for the diagram! it is giving me great ideas! I’ve always felt that whoever makes the money between my wife and I it belongs to the both of us. I feel that marriage is when the aspect of what’s yours, and mine, becomes ours. It’s not what you do, or I do, it’s what we can do to solve a financial problem, no argument. That's more or less what our plan will look like, except I don't divide savings up as much. Poor David would never get new electronics (his toys) if he didn't have his own allowance (I'm a SUPER saver, ie, deeply cheap). I'm also going to bring up the importance of the emergency fund. I always suggest setting that up before you set up retirement, as important as retirement is. It's been shown to be the most important way to keep you out of debt. If it's in a money market fund you'll still be earning some money on it, which will be compounding, but you can pull it out at any point without penalty in case of emergency. We have a 6 month fund, because I'm paranoid, but 3 months is good too. I'm SHOCKED the number of people who I find out haven't extensively discussed finances, goals, and money management before marriage... and I've seen it lead to HUGE problems. 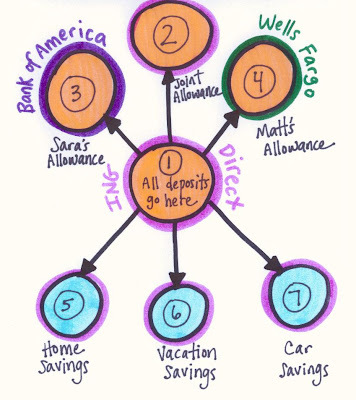 We are planning on doing something similar, but probably not with as many invididual savings accounts, probably two, one for serious things (car, home repair, emergencies, etc.) and one for fun things like vacation and gadgets. My bf & I have our own system as well. We have our own bank accounts at our own banks, but we also have a joint ING account. We have our own ING savings accounts & our own savings schedules (mine is transfered automatically after my paycheck is direct deposited). When we pay a bill, we split it down the middle & transfer the money to the person paying. We just bought our own house last October & have started a home savings account for the things we're working on fixing up. When we want a big purchase, like a TV, we each save half ourselves & when we have the total, we buy it. I also have my own 401k through work. We'll probably have to update this savings system down the road & I really like your idea, I may use it as inspiration!